Safety Speed Manufacturing will display 1,000 square feet of American-made technology at the International Woodworking Fair, Aug. 24-27 in Atlanta. 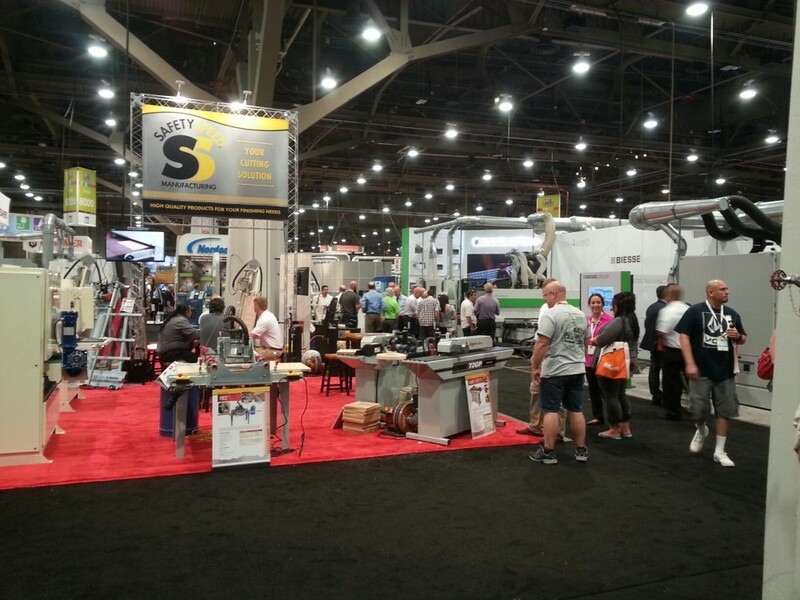 Safety Speed is taking advantage of North America’s biggest industrial woodworking event to present a full representation of its product line. The only way a woodworker could see more Safety Speed machines under power at one time would be to visit the company’s headquarters in Ham Lake, MN. If you’re in the market for a new vertical panel saw, panel router, combination vertical saw/router, wide belt sander, screw pocket machine or edgebander, then be sure to add Safety Speed’s booth #4913 to your IWF hit list. In fact, put Safety Speed at the top or your list considering that booth #4913 is located right inside the main entrance of Hall B of the Georgia World Congress Center. “We are super excited about this year’s show,” said Shawn Larkin, sales manager for Safety Speed. “IWF is our number one event and we have high expectations for its success because the wood products industry is more vibrant than it’s been in nearly 10 years and there are a lot of projects in the works. The folks who are coming to Atlanta are all investing their time and money to search for solutions and ways to improve their operations. Safety Speed’s exhibit booth will be anchored by several vertical panel saws, the flagship product that launched the company in 1958. The vertical panel saw line includes 15 space-saving models ranging from portable jobsite saws to high-production saws. Among the saws to be displayed is the new Model 7000, a heavy-duty saw that offers durability and accuracy, even when sizing the toughest composites, at a surprisingly affordable price. See Vertical Panel Saw Lineup. Stationed nearby will be Safety Speed’s panel router and popular combination machine for those who can benefit from the space-saving versatility of one machine that can both saw and rout. See Panel Saw/Router Combo Lineup. Safety Speed will exhibit its heavy-duty wide belt sanders – models 3760 and 4375 – with 60-inch and 75-inch belt capacities respectively. Both models have photo-electric belt tracking and pneumatic belt tensioning among standard features. The 75-inch has 25% more abrasive surface that translated to increased capacity, less heat accumulation, less maintenance and fewer belt replacements. See Wide Belt Sander Lineup. Special demonstrations of the Screw Pocket Machine Model SPM301 are planned throughout IWF. “We are going to show customers how they can reduce cycle times with this machine and with a modest investment in this technology improve the bottom line of their assembly operations,” Larkin said. See Screw Pocket Machine Info. The only feed-through edgebanders made in the USA will be displayed at Safety Speed’s booth. On display will be both the HA60 Hot Air Edgebander and the 72GP Glue Pot Edgebander, which offers more flexibility and capacity. See Edgebander Lineup.